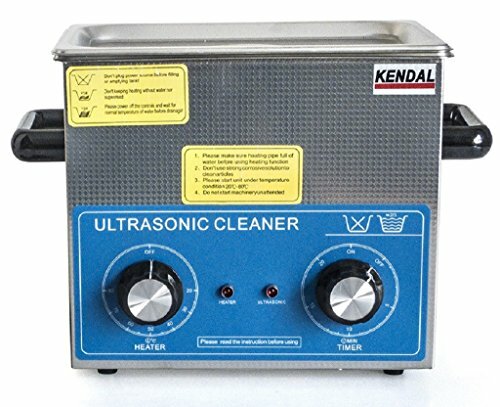 This Commercial Grade Ultrasonic Cleaner features 2 Sets of Powerful Ultrasonic Transducers. Cleaning Power: 120 Watts. Heater: 100 Watts. Tank Size: 9.5" (L) x 5.5" (W) x 4.0" (H). Tank Volume: 3 Liter (0.79 gallon). Reliable mechanical control of Cleaning Time and Temperature. Whole Body in Stainless Steel --Anti-Acid and Alkaline. Safe and Efficient Heater - Enhance Cleaning. Special Design - Suitable for Various Industrial Environment. To avoid extended and continuous heating for too long, the heater will be turn off automatically when the heating continuous working time for 2 hours. 2x Strengthened transducers make the ultrasonic more powerful (42 KHz ). Ultrasound power:120 Watts. With a 100 Watts heater. Temperature setting: 20 to 80 degree C. Time setting: 0 to 20 minutes. Large tank size: 9.5" (L) x 5.5" (W) x 4.0" (H). Tank Capacity: 3 Liters (0.79 gallon). ALL STAINLESS Construction (body, tank, cover and mesh basket). AC 100-120V 60 HZ.